Scott Lefton is the owner of Design Innovation Inc, a Massachusetts-based mechanical and new product design consulting company, with over 30 years of experience in design and fabrication. We specialize in the design of new products, mechanisms and fixtures, for consumer, industrial and laboratory use. Our expertise includes machined, sheet metal, thermoformed and injection molded components, as well as the ergonomics and visual appeal of products, and the integration of complex electronics into products and devices. We have a full machine shop in-house with CNC milling capability, and offer a network of expert partners for all aspects of fabrication including machining, rapid 3D printing, welding, plating and finishing. Our current and recent roster of clients includes Amazon Robotics, ConMed, Convergent Dental, Dirac Solutions, Duke University, Lawrence Livermore National Laboratory, LoJack, Lumenpulse, MIT, Raptor Roller Sports, Revolabs, ThingMagic, Thruwave, and Woods Hole Oceanographic Institution. Hugo Rocket on the International Space Station. The Hugo trophy is the science fiction literary world's equivalent of the Oscar. Design Innovation was commissioned to make an aluminum half-scale version of the trophy's rocket to be brought up to the ISS and presented via video link by astronaut Kjell Lindgren in August, 2015. 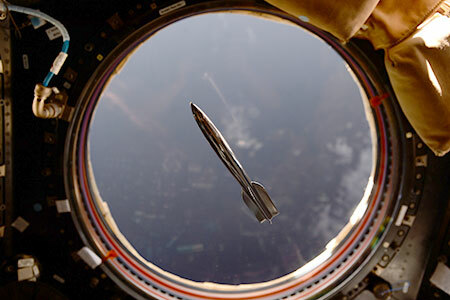 The photo shows the rocket floating in front of a porthole on the ISS with the Earth in the background. Shutter mechanism for use with a dental laser. A CO2 laser beam guide and lens assembly had to be modified to incorporate a fine-resolution, miniaturized shutter mechanism, without interfering with the existing functions of the assembly. The design and fabriication included highly intricate small aluminum, brass, Delrin and stainless steel parts, plus small fine-thread optical fasteners. Developed for Convergent Dental. 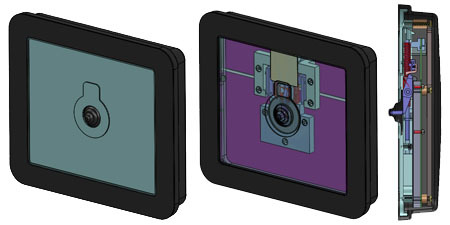 Prototype support framework and modular enclosures for a high-frequency imaging system. Designed and fabricated for the Center For Metamaterials And Integrated Plasmonics at Duke University under a subcontract issued by Duke University under Duke Universitys contract HSHQDC-12-C-00049 with the Department of Homeland Security Science and Technology Directorate. Framework and enclosures fabricated from aluminum extrusions, custom machined aluminum, fiberglass sheet, and SLA parts. Approximate framework dimensions 82 x 82 x 18, approximate enclosure dimensions, 24.5 x 18.5 x 4.5. Anti-tamper mechanism for an RFID tag. A mechanism was designed and fabricated to detect removal of an RFID tag from a mounting surface, and in the event of a removal attempt to permanently destroy the electronics inside the tag. The mechanism is inherently resistant to mechanical shock and impact in order to prevent false triggering. The project included design and fabrication of a weatherproof and impact-resistant tag housing. Developed for Dirac Solutions, Inc. and Lawrence Livermore National Laboratory. This device is currently patent pending. Secure optionally passive RFID tag or sensor with external power source and data logging. An external power source and data logging device was designed and fabricated to work with a normally (or optionally) passive RFID tag, in order to permit tag operation including data logging during periods of time where the tag may be out of communication with a transmitting base station. The device is weatherproof and impact resistant, and includes a floating connector mount. Developed for Dirac Solutions, Inc. This device was granted US patent number 9,355,545. Automated testing fixture for use with surgical laparoscopic tools. A fixture was designed and fabricated to hold one of several different surgical laparoscopic tools and to test the tool's cutting force and output the measured force and a pass/fail indication. The fixture included a complex roller clutch and cam mechanism to feed and tension a strip of elastic material used for the actual cut testing. The fixture also included a microcontroller, stepper motors, a force sensor, and numerous limit switches. I/O was provided with buttons, selector switches, LEDs, and a force displaying digital meter. The fixture also included safety interlocks preventing any component motion while the lid was open. All electronic integration, including design of the force signal amplifying and conditioning circuitry, was performed by Design Innovation. (Control electronics not shown.) Developed for ConMed. Ruggedized RFID reader for handheld computer. An RFID reader was designed as an add-on for the Trimble Nomad rugged handheld computer. (Computer & accessory pistol grip shown transparent.) An RFID module and associated electronics had to be encased in a heavily shock-mounted, IP67 sealed enclosure, which was in turn encased in an elastomer outer jacket in order to match the rubber end caps on the computer. All attachment to and interfacing with the computer had to be accomplished without interfering with existing functions and accessories. Components designed, prototyped, and verified for immersion and drop impact resistance were fabricated from stainless steel, glass-filled polycarbonate, and elastomers. 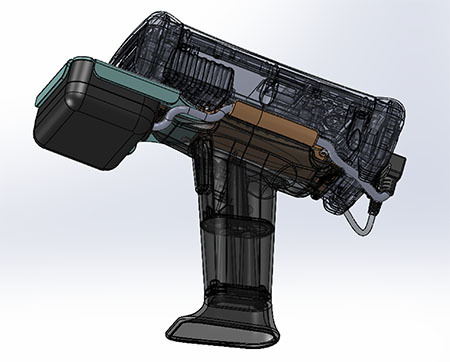 This work included the design and verification of numerous injection molded components. Developed for ThingMagic, a division of Trimble. See the actual product here. Light-up Rudolph Nose for a Boeing 747. The Evergreen Aviation & Space Museum in McMinnville, Oregon commissioned this ornament for the decommissioned Boeing 747 that is displayed on their roof. It is used as part of their annual Winter holiday celebration, and is attached to the nose cone with a set of custom straps. It is made primarily of aluminum and polycarbonate. To the best of our knowledge, it is the largest light-up Rudolph nose in the world. Containment and high-precision sensor positioning system. A fixture was designed and fabricated for use with an experimental sensing device, including miniature laminar flow chambers and comprehensive high frequency EMI shielding. (Lid is shown transparent. Extensive electrical wiring and flow tubing is not shown.) The fixture required multiple flow chambers with precise positioning and sealing, as well as the facility to install miniature temperature and humidity sensors, and integration with third-party high-frequency electronics. Materials used in the fixture include aluminum, stainless steel, Delrin, expanded Teflon, and foam-filled fabric EMI gasketing. Developed for Massachusetts Institute of Technology under a DARPA subcontract. The Nectandra Institute in Costa Rica needed a way to view and collect botanical specimens from trees in their cloud forest preserve. The device that was designed and fabricated incorporates a webcam with a custom LED ring light surrounding the lens, a waterproof and shock-mounted housing for the webcam and light, a positionable pruning-type cutter set up for remote actuation, a catch basket for specimen collection, a telescoping carbon fiber pole with a reach of up to approximately 20 feet, a base stand, guy wires, and a controller for the ring light intensity. Medical component holding fixture for use with laser marking system. Safety-interlocked enclosures including precision component holding, air filtering and optical shielding were designed and fabricated for use with surgical device marking lasers. 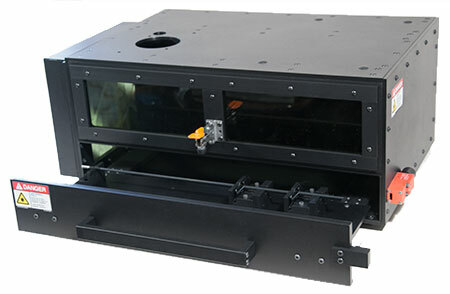 The mechanical requirements included designing nests precisely matching the complex contours of the medical components, contouring door openings and filter housings to prevent any possible escape of laser light, and providing structural support for the actual laser and laser controller, which were attached on top of the enclosure. Additionally, the component holding stage was configured to permit several different configurations of components to be marked by the same laser. Multiple units were built. Developed for ConMed. Production fixtures for assembly of products ranging from RFID devices to surgical tools to warehouse robots. 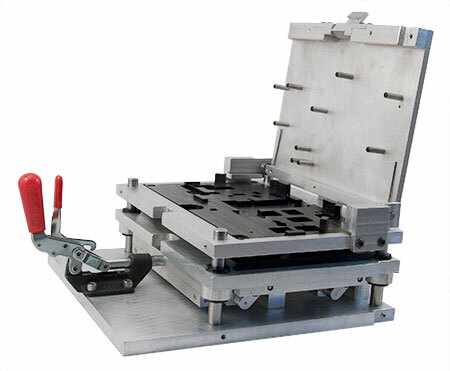 Production fixturing is designed to meet specific needs, incorporating features for precision locating, support, clamping, component insertion, pneumatic actuation, and press holding. Electrical and pneumatic safety interlocks are incorporated as needed. Test fixtures for electronic products. 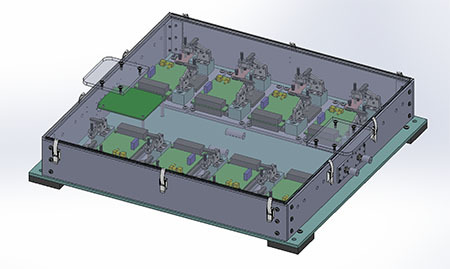 Electronic test fixtures are designed to meet specific needs, incorporating features for precision locating and holding of assembled curcuit boards. Spring-loaded, conductive pogo pins are generally used to make electrical contact with points requiring power and signal I/O on the circuit board. Fixture interfaces can include connectors, switches, indicators, power supplies, and signal conditioning circuitry. Fixtures are generally machined from Delrin plates for durable, precise feature location and electrical insulation. Mechanism parts are made from metal or plastic as needed, and electronics enclosures and/or base stands are generally made from commercially available aluminum or steel enclosures. If needed, toggle clamps, precision steel guide rails and linear bearings are used. The test fixture shown holds an assembled pc board to be tested in the black Delrin nest, and the lid is clamped down and latched to hold the board in place. Torsion springs on either side of the lid hold it in the raised position when not latched. The middle portion of the fixture holds a plate loaded with the various pogo pins, and slides along the vertical rails on linear bearings. This pogo plate is driven up and down by linkages and the toggle clamp shown at the left. Connectors on a circuit board under the pogo plate provide input and output. I also create art in metal, wood, glass, and digital media. © Copyright 2002-2018 by Scott Lefton except where otherwise indicated. Design Innovation® is a registered trademark.